With more than 50 trailheads within 30 minutes of downtown, Chattanooga is filled with incredibly scenic places to hike. But you may be surprised just how many of them also play a big part in the history of the region. You don’t have to go far to find hikes that take you back in time and allow you to learn the history of how Chattanooga came to be. Here are five local hiking destinations that offer both excellent trails and a history lesson along the way. 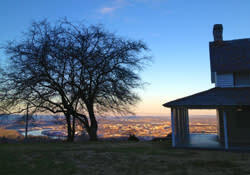 Lookout Mountain rises above Chattanooga offering a wide variety of scenic outlooks and activities. 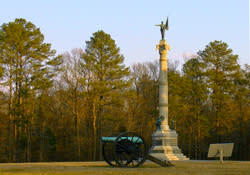 And it&apos;s the site of many historic events, including several significant battles in the Civil War. The Battle of Chattanooga, also known as the Battle Above the Clouds, ended with a victory for the north in 1963 and brought the city under Union control. Located about halfway up the mountain on the Tennessee side, Cravens House is the last of the structures from the Civil War remaining on Lookout. It was used at various times as headquarters by both Confederate and Union leadership, and it was nearly destroyed in battle. Restored in 1866, however, Cravens House remains a wonderful place to reflect on the past as well as find an impressive panoramic view of the city. From Cravens House, you have access to several of the mountain’s best hiking trails, which are moderately technical and difficult. The Big Daddy Loop is a 10-mile route featuring fantastic views of the valley and the nearby Sand and Raccoon Mountains. The distance and difficulty, however, make this one for more serious hikers. The Guild Hardy Trail is a 5-mile option that takes advantage of an old railroad bed built in 1887, so the climbs are more gentle. 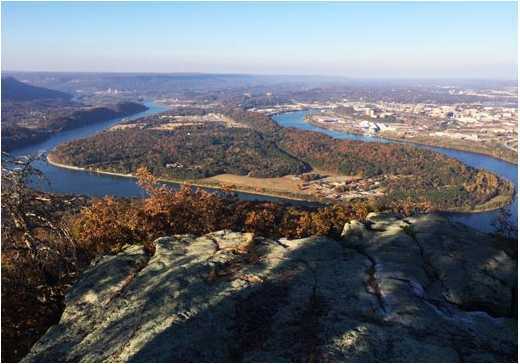 The Point Park Loop is a 4.5-mile trail that includes a solid amount of climbing, but you’ll end at an outlook with one of the best views of Chattanooga. Audubon Acres, located southeast of downtown Chattanooga, is a wonderful place to learn more about the Native American history in the area. As a registered site on the Trail of Tears National Historic Trail, the park commemorates the forced relocation of Indian nations in the southeast, starting with the Indian Removal Act of 1830. The 132-acre Elise Chapin Sanctuary features more than four miles of easy, family-friendly hiking trails to help you explore the area. 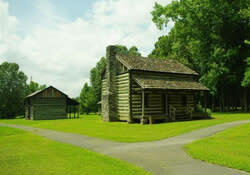 The park features the Spring Frog Cabin, believed to have been built by Cherokee in the mid-1700s and representative of the homesteads of the early 19th century. You can also explore the Little Owl Village, an archeological site that offers evidence of habitation dating back to the 1500s. As for the hikes, you’ll find very scenic paths along the South Chickamauga Creek (in addition to an impressive suspension bridge over it), and plentiful wildlife to observe. The Red Clay Historic Area is a 263-acre preserve of narrow valleys that served as the last seat of the Cherokee national government before their forced removal in 1838. The park houses an interpretive facility that features exhibits on 19th century Cherokee life and the Trail of Tears. The park features two family-friendly hiking trails. The Blue Hole Trail takes you on a short walk past the beautiful Blue Hole Spring, a deep pool that arises from beneath a limestone ledge before emptying into Mill Creek. 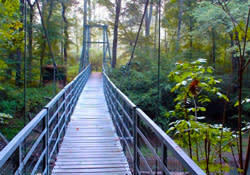 The 1.7-mile Council of Trees Trail loops through the woods and features a stone lookout platform with scenic views. In the summer, kids will enjoy cooling their feet in the clear water that flows from the Blue Hole Spring. Picnic tables, a pavilion, and open spaces for recreation are also available. National Military Park, which also includes Moccasin Bend, Missionary Ridge, and Lookout Mountain, the battlefield preserves the site of the Battle of Chickamauga in 1863, the Union’s worst defeat in the western theater and suffered the second highest number of casualties of any Civil War battle, behind only Gettysburg. You’ll find a number of guided tours at the park to help you understand more of the history involved. If you want to explore on your own, there’s a lot of ground to cover, filled with 19th century cannons and reconstructed log cabins in the grassy meadows. Most of the actual trails are asphalt, which make for easy walking. In fact, all those paved trails and roads have made this a popular spot for cycling and running. The Chickamauga Battlefield Marathon takes place entirely in the park. 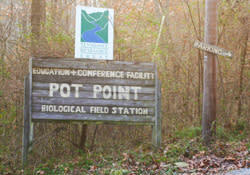 The Pot House Trail, located about 25 minutes from downtown Chattanooga in the Tennessee River Gorge, offers visitors an excellent self-guided tour that provides both historical information and amazing views of the valley. The 3.5-mile loop trail features moderately strenuous climbs, including a stop at Azalea Point, 1,000+ feet in elevation. You’ll also find the restored Pot Point Cabin, originally built in 1835 from lumber reclaimed from boats that crashed on the Tennessee River. It was restored in the 1990s and is now available for rent. Take the Tennessee River Gorge Trust pamphlet with you, which provides 12 stopping points each with their own historical information along the trail. You’ll find out about the local whiskey-making history in addition to information about plants and wildlife. You can complete the loop in about two hours, and you’re sure to be impressed by the views of the gorge.